Riggan Thomson (Michael Keaton) used to be somebody. Specifically, he used to be Birdman, a once globally beloved superhero turned pathetic pop culture footnote 20 years after his relevance (and his fortune) has faded. He used to soar above the world, patrolling the skies on wings of justice, dispensing law and order to all evildoers who would threaten the sanctity of his concrete roost. But now, Thomson is washed up. When his name receives mention, it’s enunciated with notes of incredulity and pity. Thompson influenced an entire niche of blockbusters; now, decades later, the poor sap just isn’t important anymore. The story of Thomson’s legend squandered is Mexican director Alejandro González Iñárritu’s Birdman, a movie about the rigors of celebrity; the transience of fame; the utter horseshit fakery of the drama world; artistic sacrifice; fatherhood; and about a million other themes all rolled into one fluid two-hour package. 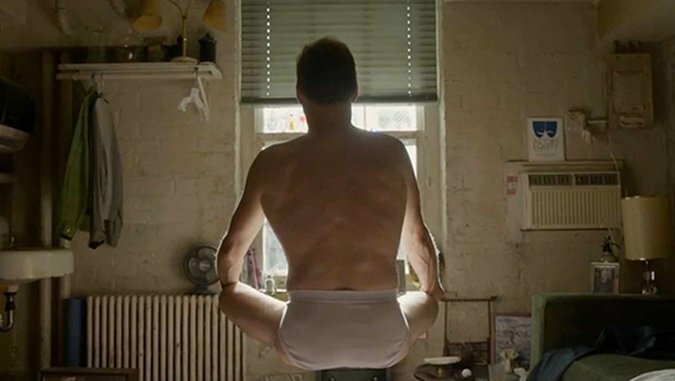 If you’ve read anything about Birdman to date, then you’ve probably heard about its big feat of technical wizardry: the film is photographed and assembled to look like one long, uninterrupted take. Iñárritu’s lens moves from dressing rooms to the stage, from the stage to the street and from the street all the way to rooftops, eventually taking flight itself and majestically gliding over the dense, clamorous backdrop of New York City. It’s a trick, of course. Even viewers who aren’t versed in spotting an editor’s fingerprints will likely be able to guess where Birdman cuts, where one segment ends and another begins. (Some, like a long shot of the metropolis’s skyline, in which evening gives way to morning, are more obvious than others.) It matters little; Iñárritu doesn’t have any pretensions toward fooling us, and the experience still feels seamless. More than that, it’s a rush. Movies don’t tend to move with Birdman’s swaggering brio, but Iñárritu isn’t making a movie as much as he’s playing with jazz-like structures (and the constant drumming soundtrack suggests as much), building themes through manic passages that are somewhere between improvisation and a kind of brilliant synergy amongst its interlocking parts. His method here is flashy no doubt, the work of a showman pushing himself with the threat of spectacle, but gimmick or not it works. The picture, really, wouldn’t be the same without it (which is more of a statement of fact than criticism). Birdman unfolds over several days as the aforementioned Thomson scurries about, trying to get his play—an adaptation of Raymond Carver’s short story “What We Talk About When We Talk About Love”—together in time for its Broadway premiere. The man is a deep-fried mess, beset on all sides by problems both professional and personal. He has to replace his male co-lead with Mike Shiner (Edward Norton), a bumptious method actor romantically entangled with Lesley (Naomi Watts), herself a bundle of nerves and a Broadway debutante-to-be; he keeps brushing off his daughter, Sam (Emma Stone), who is also his assistant; his producer and best friend, Jake (Zach Galifianakis), is buckling under the pressure of his responsibilities; the New York Times’ critic, Tabitha (Lindsey Duncan), is baying for his blood; and his girlfriend, Laura (Andrea Riseborough), is pregnant, which would be a source of joy if Thomson was remotely in a good place to raise another kid. That’s a heaping helping of headaches, but even that summary leaves the worst of what’s eating Thomson in the margins. He’s talking to himself, too, holding conversations, when no one’s watching, with the disembodied voice of the ghost of stardom past. He levitates, he moves objects with his mind, he imagines the opening of an explosive action set piece on the Big Apple’s crowded sidewalks—he is trapped in his mind’s fantasties, because his life no longer affords him such special-ness. When people do interrupt his reveries, they see a man unhinged, raving at his own obsolescence. Iñárritu’s method—the ceaseless “takes”; our inability to get away from Thomson, to escape his weird, nervous energy—heightens these palpitations by anchoring us to Thomson’s psyche. At the same time, the camera is free, and we tour through the theater, catching bits and pieces of the other characters’ ennui as palate-cleansers in between Riggan Thomson’s private moments of self-doubt. Above all else, Birdman is tender, raucously funny and deeply tragic. The final qualifier just proves that this is an Alejandro González Iñárritu film, but Iñárritu is operating on a new level here. This is intimate, personal stuff, perhaps his best effort since his first, 2000’s Amores Perros—or at least his most passionate, for more than just the director himself. The film at times reads like a dedication to Keaton’s work in Tim Burton’s Batman movies, and an admonition against the indulgent comic book rumpuses Thompson is supposed to have helped invent. There sure are a lot of pictures about caped crusaders out there, but don’t even the most over-the-hill superheroes deserve a chance to fly anew? Writer: Alejandro González Iñárritu, Nicolás Giacobone, Armando Bo, Alexander Dinelaris, Jr.
Boston-based critic Andy Crump has been writing about film for the web since 2009, and has been contributing to Paste Magazine since 2013. He also writes for Screen Rant and Movie Mezzanine. You can follow him on Twitter. Currently, he has given up on shaving.